At first glance, a race named the Monkey Face Half Marathon might seem strange, but when you understand where the name comes from it makes perfect sense. The “Monkey Face,” a 350-ft.-high rock pillar in Oregon’s Smith Rock State Park, is known as one of the world’s toughest rock climbs and draws climbers from all over, and really does look like a monkey when you view it from the right angle. Runners will start the out-and-back course for the race in Smith Rock State Park, a 641-acre park in the high desert country of central Oregon that’s known as one of the best places in the world for rock climbing. The Monkey Face, in fact, is one of the world’s toughest climbs, thanks to the bulges near its summit that make climbing all the way to the top extremely difficult. 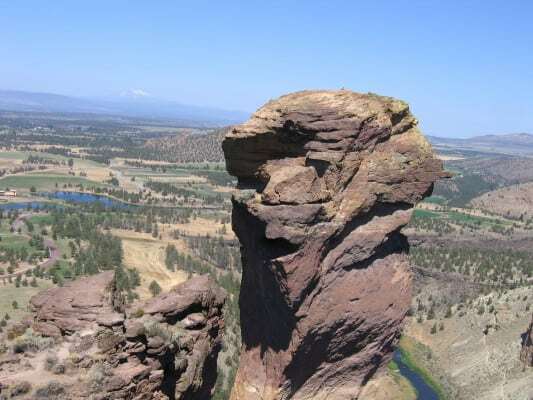 This year’s running will be run entirely on the trails within the Smith Rock State Park trail system. Organizers say the route will feature “incredible views,” as well as some very challenging hills, as runners will climb more than 900 feet in elevation between the starting line and the 2nd mile marker. You’ll make two counter-clockwise loops around the park’s trails, which include the Wolf Tree Trail, Burma Road Trail, River Trail and Rim Rock Trail. many of which unfold along the winding Crooked River. Runners also can expect to pass four aid stations out on the half marathon route, as well as a bathroom facility near the park’s helicopter landing pad. You’ll get your best views of the Monkey Face between miles 4 and 5, and again between miles 10 and 11. Located in central Oregon, just over 20 miles north of Bend and roughly 140 miles southeast of Portland, Terrebonne typically sees September temperatures between 39ºF and 74ºF, while rainfall is rare, averaging about half an inch for the month. See the Monkey Face Half Marathon course map here. To reserve your spot in the 2019 running of Terrebonne’s Monkey Face Half Marathon or 7-mile race, register online at GetMeRegistered.com here. Ever run in the Monkey Face Half Marathon? Share your impressions here, or post your review in the Comments box below. I’m trying to register online but the registration link is giving me an error message.